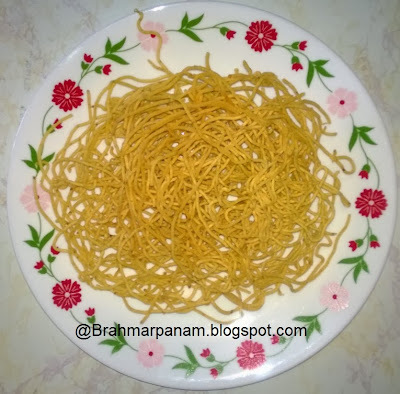 Omapodi or Sev as it is popularly known, is yummy to eat as it is, or with some chat or mixed in curd with some chat masala. This is my mom's recipe for Diwali. Wash and soak the Ajwain in a little water for 30 min and then grind the soaked ajwain with the water used for soaking. In a bowl, mix the rice flour, besan, ground ajwain mixture, butter, salt and make into a soft dough by adding more water little by little. Heat Oil in a Kadai/Wok for deep frying. Add a portion of the dough in the murukku press with the Omapodi achu and press it over the hot oil in a circular motion. When the sizzling sound subsides, flip it over and remove it with a big slotted spoon when it is done or when it begins to brown very slightly. Place the Omapodi on a paper towel to drain the excess oil and repeat the process for the remaining dough. In the end with the very little dough that is leftover we an make small rings and fry them. Kids will like them too. Enjoy the crisp Omapodi as a tea time snack! Store the remaining in a dry airtight container once it is cooled completely. Traditionally after mixing the dough we make a small cone with it and keep it aside. This cone represents the god who will be witnessing the cooking so that there wouldn't be any hassles during the process. The Omapodi dough should be mixed and made immediately else the Omapodi will turn brown.